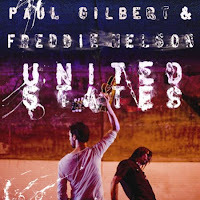 Paul Gilbert and Freddie Nelson’s album seemingly appeared from nowhere: Paul mentioned in a news update on his site that he’d completed recording a new CD, and a few weeks later it was released in Japan. A worldwide release is yet to be announced, so for now this album is only available on import. I bought mine here at CDJapan.co.jp and it was delivered in exactly 1 week. Woo! The collaboration with the not-very-well-known-yet Nelson marks Gilbert’s return to vocal music after two highly successful and progressively brilliant instrumental albums, Get Out Of My Yard and Silence Followed By A Deafening Roar. The material has a different vibe to Gilbert’s solo stuff: you can really hear him enjoying just being the guitarist again like in Mr Big. The songs have lots of wild guitar playing, but the focus is on the vocal melody, and while you can particularly hear Gilbert’s melodic influence on the opening track, ‘Paris Hilton Look-Alike,’ often the vocal melodies come from a different place to those Gilbert sings on his own solo material. Nelson’s notes often seem to ride above the fundamental tones of the chord, rather than following them like Gilbert’s tend to (which is not to discount the inherent coolness of Gilbert’s melodies). There may have been a temptation to take these songs and make them all FM-radio slick, but instead the drums sound natural and ambient, the guitars are warm and round, and there’s a live, seat-of-the-pants vibe to a lot of the material. Gilbert’s obviously enjoying the softer sounds of his Marshall Vintage Modern combo, and the sizzling treble of much of his solo stuff is completely absent here. Nelson has been compared to Freddie Mercury (which makes me wonder, is Freddie his real name, or is it a nickname that was prompted by his love of Queen? ), and while his voice itself isn’t overly distinctive, his control and range remind me of Jeff Buckley without the shakiness, or Richie Kotzen without the gravel. He has a very smooth, natural tone which perfectly suits the softer guitar tones. Paris Hilton Look-Alike. Thematically, this one reminds me of ‘Every Hot Girl Is A Rock Star’ from Paul’s ‘Space Ship One’ album. Musically it’s the most Gilbert-esque track on the album, and therefore a good introduction for what’s to come. Nelson hits some very natural, unforced falsetto notes, showing off his Freddie Mercury influence. Waste of Time. Heavy on the melody, and a lot more uptempo than track one. Kicks the album up a notch, pointing to more awesome rock power to come. The Last Rock N’ Roll Star. This one features a crazy riff in 6/8, and chugging verses that remind me a little of Van Halen’s ‘Judgement Day.’ There’s a mega-fast solo which will put to rest any lingering fears guitar fans might have that Gilbert is saving his best licks for his solo instrumental stuff these days. Bad Times Good. A bit of an Aerosmith vibe, with a stomping 4-on-the-floor groove and some melodic, old-school rock solos. It sounds like Gilbert and Nelson trade solos on this track, with Freddie on the left and Paul on the right. Hideaway. Another song that reminds me a little of stuff from ‘Space Ship One.’ A mid-tempo track with long vocal notes creating a nice contrast to the palm-muted riffage. There are some unusual, atmospheric chord choices in the chorus. The Answer. I love this one. It sounds like it could fit on Gilbert’s ‘Flying Dog’ album. There’s a nice 12-string acoustic intro before a chunky riff kicks in, capped off by a waltzy chorus and another ultra-fast solo. Gilbert’s not afraid to slam it into higher gear on this material. I’m Free. Very cool vocal harmonies, which sound like they’re achieved by sampling Nelson then playing the notes back on keyboard. This one has a spacey, ethereal vibe – yet there’s still an over-the-top shred solo, broken up by some soulful sustained notes and melodies. But lots of shred. Did I say shred? Just checkin’. Cos so far there’s lots of it. Pulsar. This one has a very funky riff which reminds me of some stuff from Mr Big’s ‘Hey Man’ album, or the way the ‘Space Ship One’ track ‘Interaction’ moves between extended guitar figures and vocal interjections. There’s a change to 3/4 time in the middle for an evil high-speed Black Sabbath vibe, along with a cool harmony solo. I’m Not Addicted. An uptempo track and great way to close out the album or a gig. This one features those famous ADA Flanger sweeps Gilbert is so known for, yet he never overuses this signature sound. A good singalong song and I imagine this one will also be lots of fun to play on guitar. This is an interesting and unique departure for Gilbert: more hard rock than his own vocal songs, less polished than Mr Big, and more easily accessible to non-musicians than his instrumentals, despite being full of astounding technique. With some major label money behind him I could see this album doing quite well in the US, and while I hope Gilbert never stops doing his own vocal and instrumental albums, I can’t wait to hear what these guys come up with next. Worth every single penny. Gilbert never let’s you down.”Waste of time”,the last rock and roll star”,”the answer”,”hideaway” are on continuous loops for last 3 days. I’m so glad that Gilbert still tries out all these new things..Awesome..